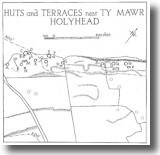 Examine an Ordnance Survey map of Anglesey and you will notice several places on Holy Island marked Cytiau'r Gwyddelod. This is the Welsh for "Irishmen's Huts", and is applied to areas with evidence of the stone foundations of ancient circular huts. With Ireland in view across the sea on clear days it is easy to see why local tradition has it that they were occupied by migrants from the neighbouring Celtic island. However, although the Irish did occupy parts of Anglesey in the post-Roman era, it is likely that these huts pre-date that. Like other hut circles on Anglesey and across North Wales, most can just barely been seen, buried under the turf and often highly disturbed by later agriculture. However, this group of circular foundations by the Tŷ Mawr farm near South Stack, have been excavated and carefully maintained by Cadw. You can walk inside the huts, see the stone walls, and wonder about what life must have been like there. Unlike the ancient village remains at Din Lligwy, which is a small grouping of buildings surrounded by a wall, these huts are scattered widely along the slopes of Holyhead Mountain. In 1865, when the site was fully surveyed, there were over 50 huts noted, with evidence that others had been recently destroyed. Since then agricultural improvement has taken its toll on more, so that by the 1930s only 20 were left. The site was excavated in the 1860s by W.O. Stanley (who was not only an antiquarian but also owner of the Penrhos estate near Holyhead and MP and Lord Lieutenant of Anglesey). He initially thought it was of Roman-era origin, as several Roman coins were found in one of the huts, but more recent evidence suggest that huts were occupied as far back as during the Iron Age, about 500 BC. Other finds nearby, of flint implements, show people had lived in the area as long ago as the Mesolithic era. Some huts were still occupied in the 3rd century, and may still have been in use for agricultural purposes in the 6th century. The construction of these huts was similar to those at Din Lligwy, with thick stone walls on which would be built rafters to produce a tall conical roof. This then was thatched. They would have looked similar to those that have been reconstructed near Anglesey's Llynnon windmill. The huts are of a variety of size and complexity, perhaps reflecting their erection and modification throughout a long period of time. Some are small simple round huts, whereas others comprise more complete homesteads, with a couple of buildings enclosed within a walled area. Excavations of the huts revealed hearths and sometimes stone platforms, as well as a number of stone tools, spindles, whetstones, and querns for grinding grain. Some buildings contained metal slag, perhaps indicating that these were places for metal working. More recent excavation in the 1980s of two of the huts (the homestead mentioned above, huts S and T1 in the adjacent map) revealed much more information about life in this village. It was here that the Mesolithic flint tools mentioned above were found. Plus, charcoal found in a hearth has been dated to the late Neolithic, showing that the site had been occupied for a long time. Limpet shells found piled up on the stone wall of one of the huts have been dated to 200 BC, showing that the hut had been built before then. This hut, the larger of the two (25m in diameter), was probably added to the homestead sometime after the smaller hut and a partial wall around the yard was built. The wall was later extended to completely enclose the yard, and the doorway of the larger hut was moved to allow for easier access. The field lying below the homestead has ploughmarks and evidence of the growing of wheat, barley and oats. Closer to the house was a narrow area of deep, rich soil surrounded by a stone wall, basically an early raised bed for growing vegetables. The Tŷ Mawr hut circles are very similar to those that have been excavated at Bryn Eryr farm, in Llansadwrn. However, unlike Tŷ Mawr, nothing can now been seen of the Bryn Eryr village; just an empty, well ploughed field. However, the details of that settlement, derived from the excavation, have been used to plan the reconstruction of an Iron Age village at St. Fagan's Open Air Museum in South Wales. To read more about this see my blog post about my visit there. The Tŷ Mawr hut circles can been reached by the road that leds to South Stack. They are just across the road from the first car park.